Caring Kitchen Executive Director Marilyn Cohn, middle, accepts a check in the amount of $1,430 from Champaign Cruisers Car Club President Nelson Faulkner, right, and club Vice President Paul Fry, left. The Champaign Cruisers’ 18th annual Firecracker Car, Truck and Bike Show held July 4 at the Skelley Lumber Company in Urbana will go down as the club’s largest show to date. While numerous entrants walked away from the show with trophies and door prizes, the biggest winner of the day just might have been the Caring Kitchen in Urbana, which received half the proceeds from the 50/50 raffle. On Monday, Marilyn Cohn, executive director of the Caring Kitchen, received a check for $1,430 from the club. “A donation like this is amazing,” Cohn said. “Right now, our shelter is full with a waiting list, and the number of meals we serve at lunch and dinner are up from a year ago, as is the number of food boxes we are doing. “Any donations that come in to Caring Kitchen are greatly appreciated,” she added. 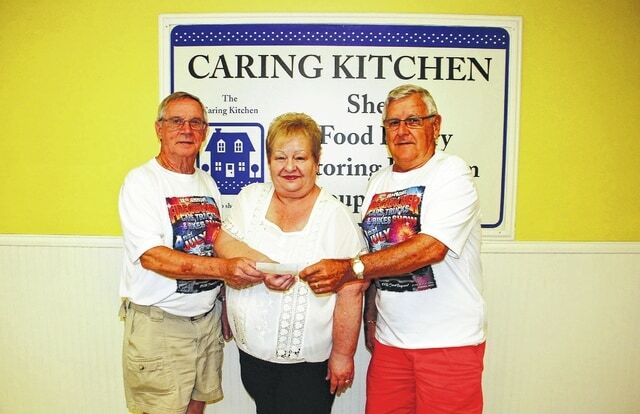 Faulkner said the car club, which currently boasts 95 members from eight counties, has been donating half the proceeds from the car show’s 50/50 raffle to the Caring Kitchen for 18 years. “We give to Caring Kitchen because it helps so many people,” he said. Since its formation in 1997, Faulkner said, the club has donated $58,000 to area organizations, cancer patients and individuals displaced by house fires.